RIM's stock price took a dive last month when the company announced that their service fee structure was being revamped for the Blackberry 10 launch. 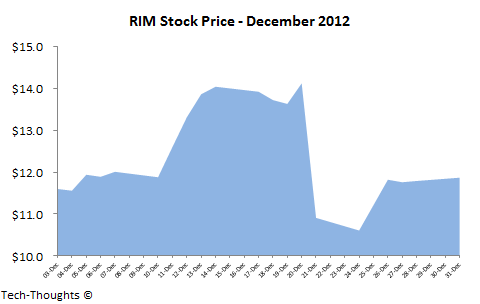 Since the services segment is RIM's last remaining high margin business, the stock market has every reason to be worried. Let's take a look at the impact these changes could have on RIM's financial performance. 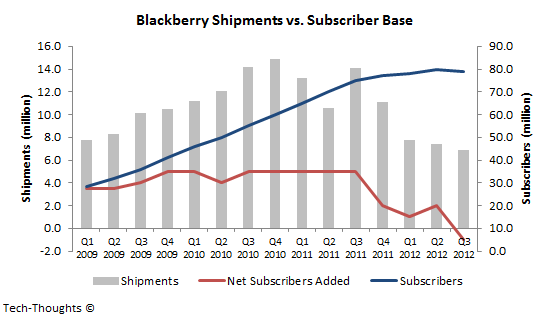 In their latest quarterly results, RIM posted their first ever decline in subscriber base, while Blackberry device shipments saw their fifth consecutive sequential decline. However, the situation with their services segment is not as dire. 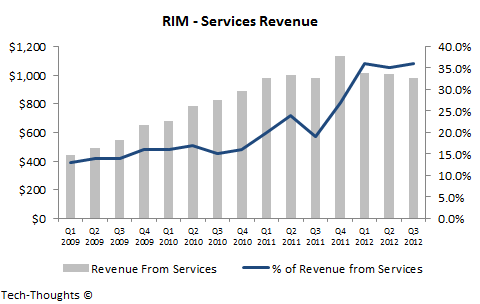 RIM currently records approximately $1 billion in services revenue every quarter. Since services revenue is driven by install base and not sales, it has seen a modest decline over the past year, as opposed to the sharp decline seen in other segments. Since RIM reports the size of its subscriber base at the end of every quarter, it would be incorrect to use that figure to compute the average revenue per user (ARPU) for Blackberry services. Instead, it would be more accurate to consider the average subscriber base in the quarter. 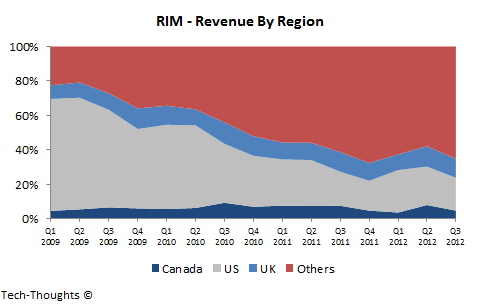 Over the past three years, RIM's revenue concentration has shifted from the US to Emerging markets. While the chart above does not break down revenue from countries beyond Canada, the US & UK, it is well-established that emerging markets (particularly India & South East Asia) are RIM's last remaining strongholds. As a result, RIM's subscriber mix has shifted from high end corporate users (Blackberry Enterprise Server customers - higher ARPU) to the consumer segment (Blackberry Internet Service customers - lower ARPU). Also, a majority of these consumers in emerging markets are at the low end and typically subscribe to Blackberry's messaging services (BBM) without an accompanying data plan, i.e. they essentially use Blackberry devices as feature phones with advanced messaging capabilities. As a result, the ARPU for Blackberry services has seen a sharp decline. With the introduction of the BlackBerry 10 mobile computing platform, we will be transforming our service revenue models to reflect different usage levels of our network infrastructure and different value-added software security and service packages. So we plan to offer a range of security, mobile device and application management services, in addition to communication services. We will position BlackBerry Enterprise Service as the leading cross platform enterprise mobile device management service, and continue to invest in growth capabilities. Subscribers that require enhanced services, including advanced security, mobile device management and other services are expected to continue to generate monthly service revenue. Other subscribers who do not utilize such services are expected to generate less or no service revenue. This rationalization of service fees will have no impact on BES customers, but will have a significant impact on BIS customers (especially on those with data-devoid BBM plans). Given RIM's recent slowdown in emerging markets and the high-end nature of early Blackberry 10 devices, I would assume that this rationalization would affect current subscribers as well as Blackberry 10 buyers. 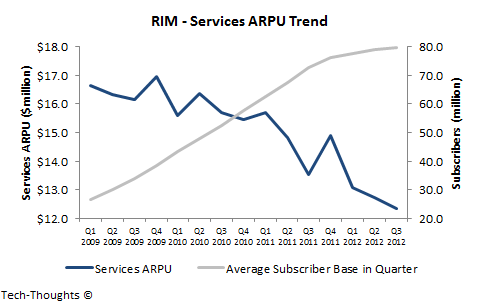 With RIM's current subscriber mix, I would estimate that RIM could lose approximately 50% of revenue from BIS users. This could cause a revenue loss of approximately $200-$300 million per quarter, i.e. approximately $1 billion annually. Even if only 50% of RIM's subscriber base is affected, the revenue loss would total about $100-$150 million per quarter. 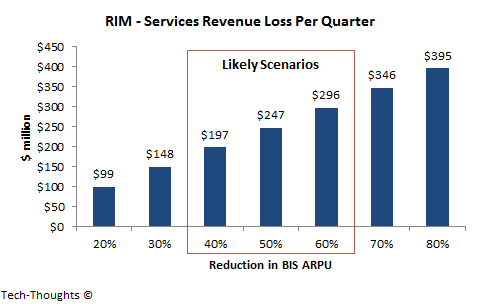 The fact that this revenue loss comes with no associated cost reduction means that it could put a major strain on RIM's cash position and hence, its survival. Of course, RIM is hoping that Blackberry 10 will help grow its enterprise subscriber base to mitigate the ARPU drop among BIS users, but that is quite unlikely.